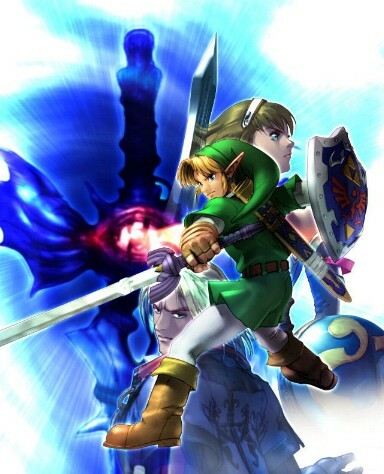 This tale of souls and swords, begins not long after the Hero of Legend summoned by Princess Zelda, Link, defeated the wizard Agahnim and returned peace to Hyrule. Before he could do so much as lay the Master Sword to rest, he was informed of an investigations carried out by the Sages. The wizard who brought many disasters was once a righteous one. What had changed him, was an evil which reached from a different world. The soul-devouring evil sword, Soul Edge. A frightening sword that overtakes the heart of its wielder. Soul Edge had recently been shattered into many shards by its counterpart, Soul Calibur. Unfortunately, one of those shards made its way to Hyrule's past. Somehow, by coincidence it reached the hand of the wizard, and immediately the shard's evil took him over. As the evil sword fed the shell that was the wizard could be controlled by the great evil which threatened Hyrule from the Dark World and the land was forced into the crisis Link had just overcome. Although the evil sword was in its broken and scattered state, there was no doubting the danger it represented, by easily tainting the hearts of people with evil. Through the events that just transpired, Soul Edge was notified to the existence of Hyrule. Sooner or later, it would certainly stretch its grip toward the peaceful and blessed land. The Sages once again conferred deeply about Soul Edge, and foreseeing the gathering of the remaining shards that would revive Soul Edge in the other world, they came to realize there was not a moment to hesitate. Upon hearing about the evil sword Soul Edge, Link nodded quietly. In order to prevent another cataclism, he made up his mind to cross into the other world and destroy Soul Edge. One night, while the townspeople who knew nothing about Soul Edge slept peacefully, he packed up for his solitary journey. Master Sword, Hylian Shield, Fairy Bow, Boomerang, Bombs. ...And Ocarina. His preparation was complete. On his mission to destroy the evil sword, Link fought against and alongside many skilled Souls. Warriors such as the ninja Taki, the spirited Cassandra, the vindicative Maxi, the tragic Ivy and still others, joined the battle against Soul Edge. Eventually, Link tracked down the man who possesed the most of Soul Edge, a knight known as Nightmare, to Ostrheinsburg Chapel in the middle of Europe. Link came moments before the fallen noble Raphael, who sought the cursed sword for his personal ambition, could challenge Nightmare and the two engaged in a furious duel. Defeated, Raphael was about to be finished by Nighmare, but he muttered a few words that carried all of his sorrow and regret, causing the spirit of the young boy posesed by Soul Edge, Siegfried, to stir and hold the Nightmare back for a moment. With his last bit of strenght Raphael thrusted his sword deep into Soul Edge, which weakened the Nightmare further. Link's magical senses felt the turmoil within Nightmare's mind, and his spirit joined Siegfried's in the battle against that of the evil sword, Inferno, a malevolent being of bones and flames. A hardous battle resulted within Siegfried's mind, but eventually the sword was defeated and Siegfried could reclaim his body. At that moment a holy light shone and the sword Soul Calibur, the blade that opposed Soul Edge throughout the ages and that had been trapped in limbo by the latter, appeared in front of him. Instinctively Siegfried took the sword to drive it into the eye of Soul Edge and both swords seemed to lose their power. Siegfried took off the cursed armor and the chitinous arm that had grown over his, disgusted at what he had become. Link and him looked at each other in the eyes and came to a silent understanding. Siegfried took upon himself to secure both swords from anybody who could misuse them and find a way to ultimately seal them away for the rest of eternity. Before leaving Link took notice that Raphael too would live despite his wounds. Having seen to the sealing of the terrible evil, Link not only saved his homeland from peril, but also maintained the tranquility of the world he came in. Link then quietly left for Hyrule- a faint echo of his Ocarina was all that remained.